Cucumbers may be the ugliest of all the veggies. What is with all the bumps and odd shapes? We have grown a lot of different cukes over the years but we keep coming back to the Marketmore 76. Now if you read the advertising for this cucumber it tells you that they are long and slender but we don't really see that to be the case. They grow from 6 to 10 inches and usually get pretty fat! Maybe we water too much? Nah, that can't be it because we always get a great crop of tasty cucumbers. Sometimes we pick them when they are small and pickle them using our homegrown dill. Sometimes we let them get bigger and then put them in a salad or slice them and pickle the slices! Like all veggies, Cucumbers prefer fertile, well drained soil that has been enriched the season before with compost. 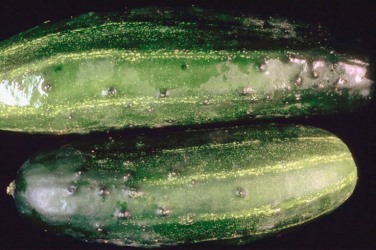 Cucumber plants should be set out when all danger of frost has passed. Space about 12 inches apart. To conserve space grow them with supports. If allowed to sprawl on the ground they can cover 10 or 12 feet. Growing on supports also helps with ground bugs and slugs that like to hollow out the fruit as they lay on the ground. We allow ours to sprawl but always spread Sluggo on the ground to prevent slugs and other insects from destroying our fruits. When you harvest resist the urge to pull them off the vine which usually ends badly for the plant. Use your nippers or knife and cut cleanly off the vine. Click here for cucumber recipe inspiration.